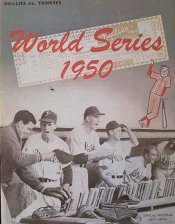 The 1950 World Series was the 47th World Series between the American and National Leagues for the championship of Major League Baseball. The Philadelphia Phillies as 1950 champions of the National League and the New York Yankees, as 1950 American League champions, competed to win a best-of-seven game series. The Series began on Wednesday, October 4, and concluded Saturday, October 7. The Phillies had home field advantage for the series, meaning no more than three games would be played at the Yankees' stadium, Yankee Stadium. The Yankees won their 13th championship in their 48-year history, taking the series four games to zero. The final game in the series resulted in the New York Yankees winning, 5–2 over Philadelphia. It was the only game in the series decided by more than one run. This was the last all-white World Series as neither club had integrated in 1950. The same teams would again meet in the 2009 World Series, and in that year the Yankees would once again win the MLB championship. The Philadelphia Phillies climbed to the top of the National League thanks to a clutch performance down the home stretch by twenty-game winner, Robin Roberts. Roberts pitched three times in the last five days of the regular season and although he managed to nail down the National League pennant, the marathon had left him unavailable for a Game 1 start. Manager Eddie Sawyer was left with a limited rotation due to the late-season loss of Curt Simmons (seventeen victories) to the Army and recurring injuries to rookie pitchers Bob Miller and Bubba Church. The Philly skipper shocked everyone after nominating a thirty-three-year-old right-hander named Jim Konstanty, who had not made a single start during the 1950 regular season. He did however appear in seventy-four games and the standout reliever was 16-7 with a 2.66 earned run average. Konstanty was confident and certainly up to the challenge (and what a challenge it would be). His opponent was none other than the defending World Champion New York Yankees who had swept six previous World Series (Pirates, Cardinals, Cubs, Reds) in twenty-four years and captured twelve World Series titles to date. Many felt that another sweep was a foregone conclusion, but Philadelphiaa was determined to prove their critics wrong. Konstanty rose to the occasion and pitched a superb outing against the American League champions while allowing only one run and four hits in eight-innings. Unfortunately for the Phillies, Philadelphia's Vic Raschi spun a two-hit, 1-0 shutout for the opening lead. By now, Roberts was well rested and more-than-ready for Game 2. The Philadelphia ace went up against New York right-hander, Allie Reynolds and neither blinked through a 1-1, nine-inning standoff. So far, through two regulation games, there had been a total of three runs scored as the pitchers clearly dominated the contest (much to the dismay of the crowds). Joe DiMaggio added a fourth to the total after launching a leadoff homer in the tenth for a 2-1 triumph. Now down two games to none, the Phillies were desperate for an advantage on the mound and called upon an unlikely hero named Ken Heintzelman (a seventeen-game winner for the Phillies in 1949 but a lowly, 3-9 pitcher in 1950). Despite his regular season stats, the lefthander started beautifully in Game 3 against Eddie Lopat and carried a 2-1 lead going into the eighth. After retiring the first two Yankees, Heintzelman stuttered and walked three consecutive batters in the inning. Sawyer saw that it was time to make a change and called for Konstanty who induced Bobby Brown to ground to Granny Hamner. Unable to get a break, the Phillies' winced as their shortstop fumbled the ball, and the tying run scored. The Yankees continued their momentum in the ninth as Jerry Coleman stepped up to the plate and sealed the 3-2 victory. Despite being on the verge of another Yankees sweep, the Phillies had kept pace with the perennial champs and only lost by three consecutive one-run decisions (the closest of any contender in any previous New York rally). Their efforts however, would be in vain, as Casey Stengel introduced a young up-and-coming talent in Game 4. His name was Ed "Whitey" Ford and the rookie went 9-1 during the regular season after being called up from Kansas City of the American Association. After teammate Yogi Berra led-off the Yankees' attack with a run-scoring single and a bases-empty homerun, Ford breezed into the ninth inning with a 5-0 lead. A shutout seemed inevitable for Ford as he forced Andy Seminick to hit a textbook fly to leftfield. However, Gene Woodling dropped the ball and both Phillies runners scored. Reynolds came in to get the last out, making the Philadelphia Yankees 5-2 winners and repeat champions. Woodling, who tied Granny Hamner for the World Series batting lead with a .429 average, was distraught over his failure to protect the shutout. Ford was less concerned and happy with the win (which would be the first of many in the Fall Classic). 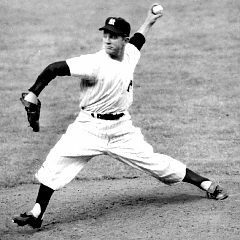 In fact, the Yankees newest ace would go on to set several World Series records. "The Chairman of the Board" as he would later be called still holds the World Series records for most wins (ten) and most strikeouts (ninety-four).